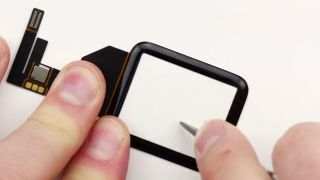 You're thinking about buying an Apple Watch, but you're worried: you live in that pesky house full of knives and stones and other pointy objects, meaning that screen is ripe for a-scratchin'. That worry is most pertinent for the Apple Watch Sport, which has a "strengthened Ion-X glass" whihc is different from the tough-as-nails Watch and Watch Edition, which are both protected by the sapphire glass technology from the iPhone. Unbox Therapy managed to get a sample of the glass used on the wearable and decided to do the only sane thing – take to it with keys, a knife, steel wool and sandpaper. Although the glass isn't as tough as Sapphire we do find out it can take a real beating with a knife, key and steel wool not managing to damage it at all. The sandpaper however does some real damage to the display, so if you're one of them belt sander users who thinks it's a laugh to dangle limbs near machinery, you're in trouble (even beyond the obvious danger). Unfortunately there's no drop test to look at here, so hydrophobic cliff-divers won't know if this is the timepiece for them. Apple is worried about skin irritation as well.